On the following pages you will learn everything about our company, our services and products. We hope you enjoy the read through our site. We are not a franchise or referral service. guaranteed by a local cleaning business you can trust. Window Cleaning Specialist relies on it! 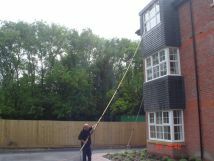 Window Cleaning Specialists provide a professional window cleaning service to both domestic and commercial customers. We are happy to cover: Walsall / Cannock and surrounding areas. Fully insured. Chemical free & SAFE, window cleaning. The water fed pole window cleaning system works by pumping pure water from the van up through a carbon fiber or fiber glass pole on to the window; this is then scrubbed, rinsed and left to dry naturallyto leave a streak free finish. Window cleaners have traditionally used methods of window cleaning that use detergents which leaveehind a residue that allows dirt to stick to it. The water fed pole window cleaning system does not leave anything behind and so, windows stay cleaner for longer. Ordinary tap water is filtered overnight, and then pumped into a tank in our van. The water is filtered once again as it is pumped from the van through a telescopic pole and onto your windows. The brush scrubs any dirt from the windows while the water washes the dirt away. • Framework can easily be cleaned each time that the windows are cleaned. • Reduced disturbance and increased privacy. 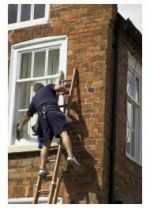 • Most previously inaccessible windows can now be cleaned. • No chemicals are used in the glass cleaning process. Other surfaces can now be cleaned with ease. These include; cladding, canopies, conservatory roofs, guttering, fascias, garage doors etc. Please let us know if any of these services are of interest to you. we have decided to invest in this technology which involves the use of telescopic poles and 100% pure water,which we filter through a process of reverse osmosis and de-ionization. We are embracing this technology for a number of reasons. Dirt particles are agitated using a purpose made, soft bristled brush, and rinsed away using extremely pure water. You may be surprised to know that no chemicals or detergents are required. You should also expect to see the windows cleaned using this method left wet. Don’t worry, this is normal. It may be a little disconcerting at first, since this is not what you have been used to, but please be assured that the windows will dry naturally, and once dry you will be no doubt be impressed with the results. Even the window frames will be cleaned each time for FREE! You will likely notice that the windows seem to stay clean for longer. This is because there is no sticky soap residue left on the window. Usually rainfall would mix with this soap residue and form little spots on the windows. After a little while using this method, all traces of the soap residue will be rinsed away. The rain will have no soap residue to mix with and therefore they will appear to remain cleaner for longer.